Saint-Tropez stands out, however, because Brigitte Bardot came to town and stayed, bringing many of the world’s jetsetters in her wake. It had already attracted artists and others, but the big-time parade started in the 1950s. It carries on today but with different faces diverting the paparazzi. 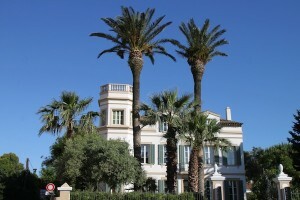 Saint-Tropez draws 5 million visitors annually, a thousand for each resident. 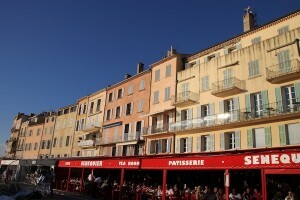 View of the colorfully painted houses that line the Saint-Tropez harbor where yachts moor by the hundreds. 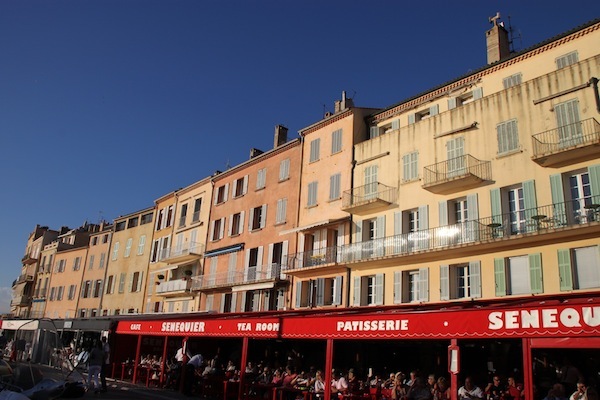 • Change nothing on the exterior — well, not so Saint-Tropez ever looks like anything but an unmolested fishing village from some imagined idyllic past. The town fathers even dictate the paint colors, based on a Genoa-inspired palate, for each building. • Change anything or everything inside if necessary to keep “top-level” clientele coming back for more. Take the interiors of big-brand, upscale stores as an example. Claude Maniscalco, general manager, Saint-Tropez Tourisme, explained that such retailers have to move every two years because landlords won’t offer longer leases. If they did, the law would keep them from raising rents, rents they are loath to give up when the real estate market is hot. At the same time, Maniscalco said, the retailers must constantly introduce new merchandising “concepts” to hold the customer’s attention. And so, shoppers can get a meal at Dior, walk through gardens at Louis Vuitton and at least look at the swimming pool in the house Chanel now occupies. The Chanel site would have been someone’s fine home, but the other shop exteriors belie their interiors. My group (travel journalists and travel agents) had dinner at Hotel Byblos, a Leading Hotels property that opens only for the season, roughly mid-April through October. This hotel hosts Les Caves du Roy, one of the village’s hottest clubs. Its patrons have to pay enough for drinks to buy the furniture. Christophe Chauvin, general manager, explained that customers do so much damage, such as by standing on furnishings in high heels, that the club is renovated once a month in season.